This is my first modest vintage Italian (or is it Japanese?) grab to test the waters. I love wasp-bodied knives so I figured what the hell. 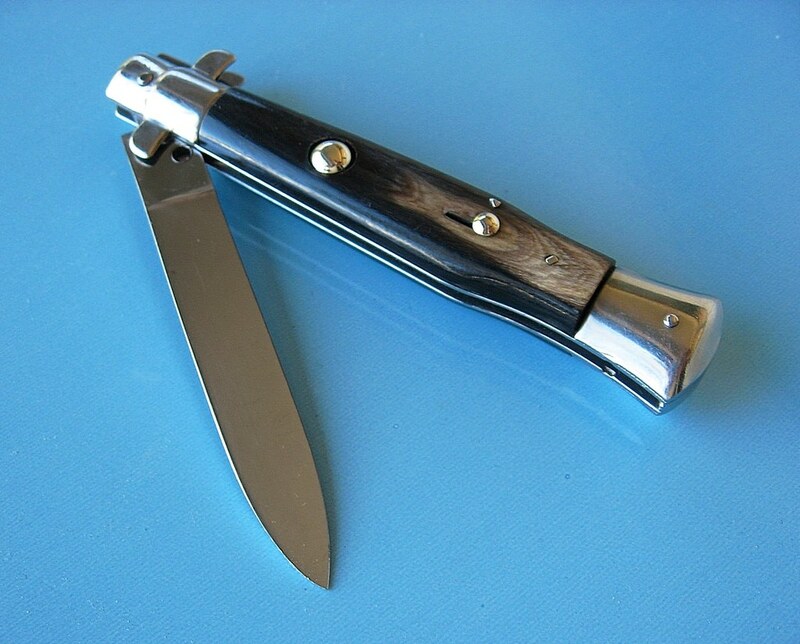 7-5/8" OAL, button open/close, flat-guard pagoda (some call it derby) bolster, D-stamped liners, two-piece spring, full unswedged blade, tight, straight, and snappy. The button, safety, liners and bolsters all appear to be steel. I assume this guy was made in the early '60s. That is an AWESOME little wasp-bodied knife, Rick!! I have not seen a Wasp that small before! I sure is pretty!! 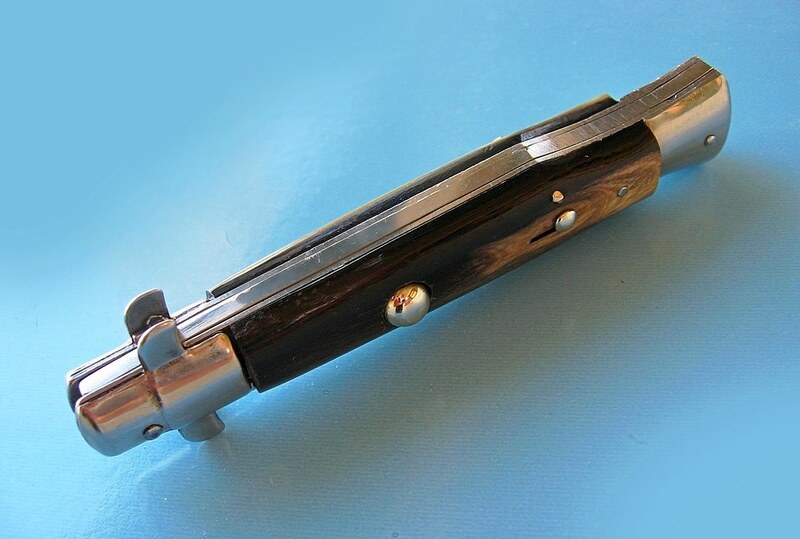 It looks like Brazilian or dark Horn...That a really nice SCORE...the Tang does not really identify the maker. Thanks, Barb. I've searched the archives here and elsewhere, and these come up once in a while, but I've never seen anyone offer a best guess on the maker. If anyone knows, or has one share, please chime in. Pics welcome. Great piece Rick! I'm 99.9% sure it's Italian. (leaves room for my error lol). Thanks, Chris. The general consensus in the threads on these little BO/BCs concurs with your assessment. I've also read that it's unlikely that Japanese makers from that era would mark their knives rostfrei, but that's purely anecdotal. And, as Barb pointed out, the horn sure looks Brazilian or similar. The Derby Bolsters, BO/BC and Wasp Body certainly make this a super piece. Love it! Firstly lovely BO/BC you posted ...nice horn . 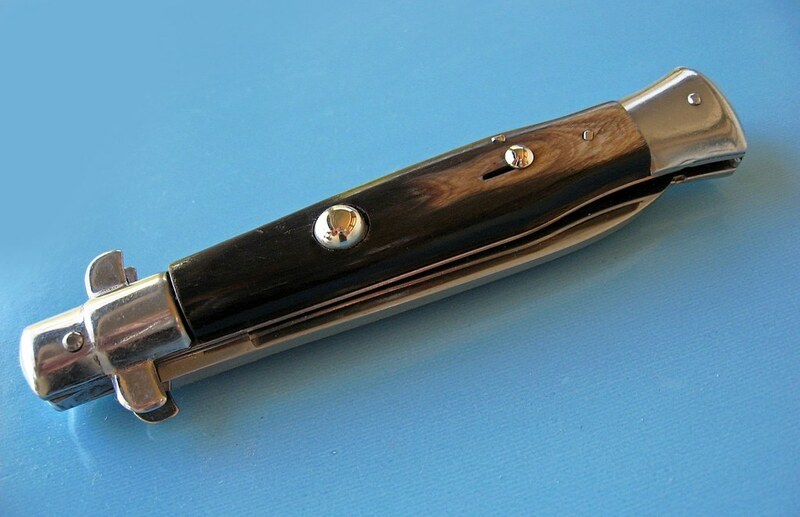 I have a version that is very similar but mine is marked INOX instead of Rostfrei.My blade is also different as it is a swedge blade. 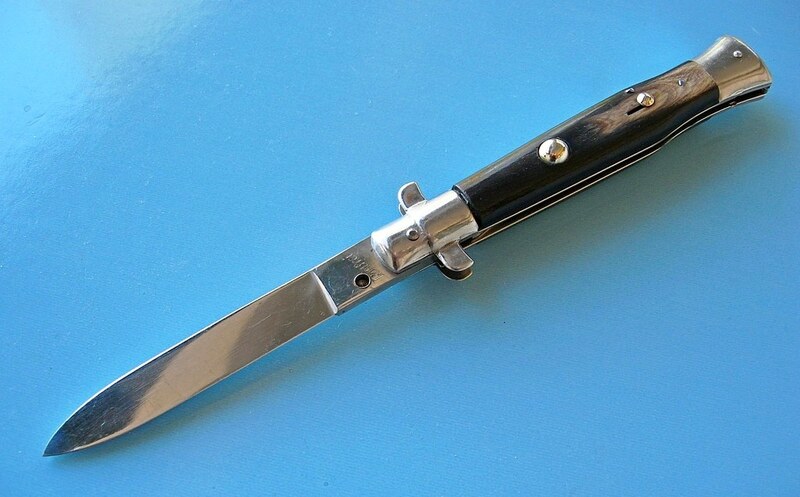 I think when I posted it sometime back it was established that these were indeed italian as the Japanese didnt mark their blades Rostfrei or Inox . The bolsters are strange imho, the way the ears are riveted, and my version although horn isnt what I class as 60s italian quality but I trust the older members word and opinions. I have posted a couple of pictures here ...the one with the swedge blade in the bottom pics is mine swedge blade wasp INOX marked . The other top 2 pictures with much better horn like your example and marked Rostfrei the same belongs to whippersnapper, and I hope my freind doesnt mind me posting it to show you.,as he shared it on my post . I hope others chime in as I too couldn't find an awful lot of information when I posted mine either. Hope it helps and that you are well. Sorry, I don't know much about them. Seems like one of the members has a large collection but I can't remember who? May have been Lance or belmont or scotty? Seems like there is quite a few threads over at the sharperdeals forum if you search derby or pagoda bolster. I think you have to register to enter the forum. Thanks, guys. Gravknife, I appreciate the informative post! I'm surprised that the BO/BC feature isn't more common. 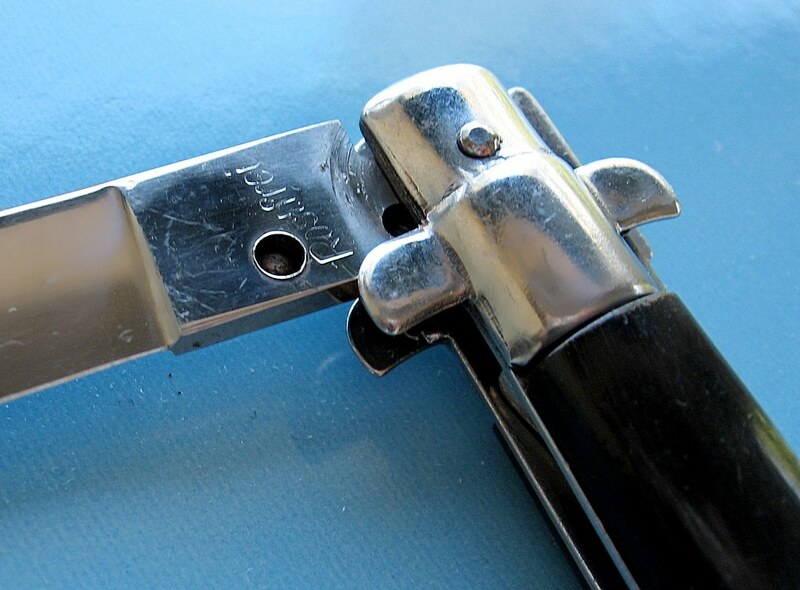 Two sear pins riding on the same rocker may not be as robust as an external locking tab, but it sure is handy, and the lockup on mine is tighter than a couple of my modern high-end picklocks. 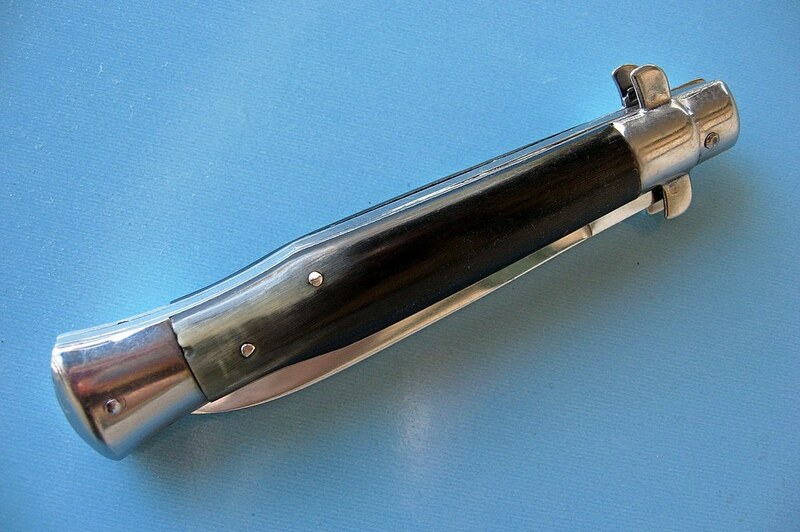 Regarding the frame construction, are the steel bolsters riveted? Looks more like some kind of crimping to me. I'm not sure but I agree it looks like a crimp.